The Pound was clearly disinterested this afternoon after Prime Minister Theresa May asked Members of Parliament to grant her more time for Brexit talks. Investors who were hoping for some fresh insight into the progress of Brexit negotiations were left empty handed after her update brought nothing new to the table. With the European Union repeatedly stating that the withdraw agreement is “not open for re-negotiation”, it will be interesting to see what May actually achieves with the extra time. The pound’s muted price reaction to May’s speech suggests that Brexit fatigue may be setting in as traders become increasingly detached to the endless Brexit drama. Some complacency about the possibility of a no-deal Brexit is also supporting the Pound, as expectations mount over the government extending article 50. For those who are wondering why the Pound eventually pushed higher this afternoon despite May’s plea for more time and Carney’s cautious speech, the answer can be found in the Dollar. A depreciating Dollar was the primary driver behind the GBPUSD’s modest rebound towards 1.2890. 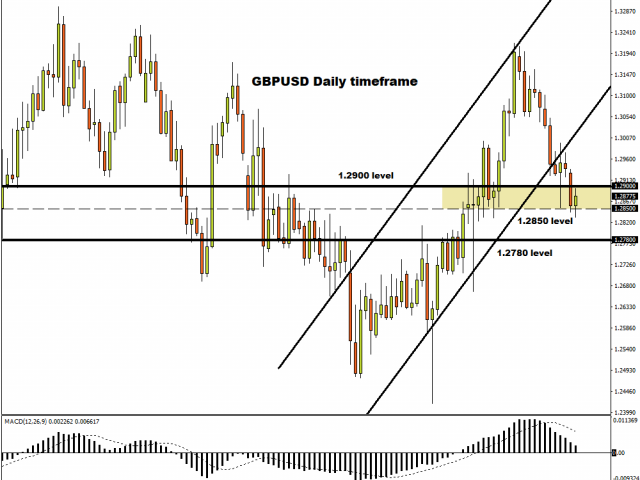 While the GBPUSD is seen trading higher if buyers are able to conquer 1.2900, any meaningful upside gains are poised to be capped by the “fog of Brexit”. In regards to the technical picture, the GBPUSD remains bearish on the daily charts. A breakdown below 1.2850 is likely to open a clean path towards 1.2780. Global oil prices were bullish today thanks to OPEC led production cuts and US sanctions against Iran and Venezuela’s oil sector. Recent comments from Saudi Arabia stating that it will trim oil production to nearly 9.8 million bpd in March came as a welcome development for Oil markets. With the partial closure of the Keystone pipeline also fuelling concerns of possible supply shocks, the near-term outlook for oil tilts to further upside. Zooming out and taking a look at the bigger picture, the longer-term outlook remains bearish. With surging US Shale production stimulating oversupply concerns and global growth fears seen impacting demand for Crude, bears still remain in control. Technical traders will continue to closely observe how WTI Crude behaves within the $54 – $51 trading band. A breakout or breakdown of this trading range may determine the next key trend.